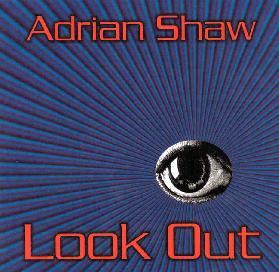 Adrian Shaw - "Look Out"
This is the 4th solo CD (5th release if you remember the Aerial Dance cassette) and follows in the footsteps of the excellent Head Cleaner and features once again, Nick Saloman, Bari Watts and Aaron Shaw playing on a few selected tracks. The 11 tracks on this CD come across as more personal than some of Ade's other material but the home studio sound is excellent. The CD starts off with "I Don't Think So" which features Nick, Tony Hill and Aaron Shaw adding some great guitar work. This is my favorite track on the CD and starts slow but has great psychedelic guitar parts and Aaron plays some really nice acoustic guitar at the end. "Another Face" starts as a purely piano number but builds in the middle as Ade layers in loads of vocals and a cool synthesizer buzzes in from the sides and comes back to the piano. "Rhododendron Mile" has a bit of a countryish twang to it and even a great Bob Dylan harmonica line. "The Chosen" has a haunting guitar and bass line before the 60s organ sound is layered in. I really liked the delay wah guitar solo at the end. "Few Are Called" is one of the best songs on the CD and includes some really strange sound samples from politicians, TV, blues, etc. A great bouncy bass and piano line. ("I now spend my time watching the flys on the ceiling...."). "Remembrance Of Things Past" is a very personal song it would appear with piano and acoustic guitar. "Father's Day" is next and features Bari Watts on lead guitar. This is a fantastic slowly building song. I guess Ade is not feeling as young as before despite that he is still going out on rock and roll tours, having to set up his own gear, load the van, etc... as this song is called "Oh, To Be Young". A short instrumental song. "A Modern Man" follows and is the most psychedelic song on the CD with the studio effects, strange interludes and vocals. "Cool Blue Reminder" features some great raw slide and wah guitar and sounds like the vocals were recorded inside a large trash can or something. "Childhood's End" finishes off the CD. Another excellent psychedelic rock CD. Not as heavy but just as much variety as in the past and some fantastic songs. The picture on the back of the CD is Ade's home studio for those who were wondering.